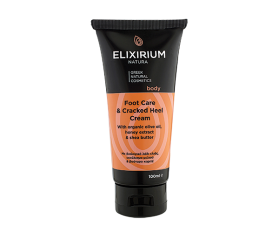 ELIXIRIUM NATURA - FOOT CARE AND CRACKED HEEL CREAM. 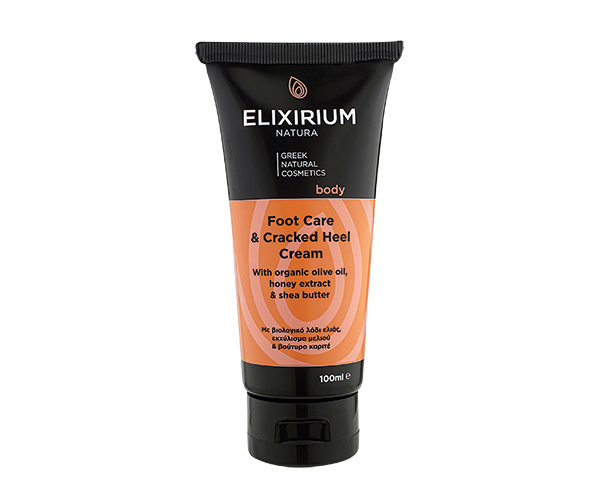 HomeElixirium NaturaBODYELIXIRIUM NATURA - FOOT CARE AND CRACKED HEEL CREAM. With organic olive oil, honey extract and shea butter . Foot care cream with organic olive oil, shea butter for hydration and nourishment. With honey and aloe extracts that accelerate potent moisturizing, nourishing and regeneration. With Vitamin E to improve skin elasticity. Refreshes and relieves tired legs while giving them a pleasant feeling of relaxation. Use: Apply on the feet as often as necessary. Συστατικά/Ιngredients: Aqua, C10-20 Acid PEG-8 Ester, Glyceryl Stearate, Ethylhexyl Stearate, Glycerin, Cetearyl Isononanoate, Cera Alba (Bees Wax), Butyrospernum Parkii (Shea Butter), Cetyl Alcohol, Olea Europaea (Olive) Fruit Oil, Cyclopentasiloxane, Phenoxyethanol, Aloe Barbadensis (Aloe Vera) Leaf Juice, Mel (Honey) Extract, Xanthan Gum, Dimethicone, Parfum (Fragrance), Imidazolidinyl Urea, Allantoin, Panthenol, Ethylhexylglycerin, BHT, Tocopheryl Acetate, Alpha-Isomethyl Ionone, Limonene, Coumarin, Eugenol, Linalool, Citronellol, Benzyl Alcohol, Geraniol, Hydroxycitronellal.